The site let me test out strategies on simulation and backtest how different trading bots would have performed on coin pairs. I saw that it was producing green on a lot of what I tested so I decided to go for it—with some real holdings of mine. I tested the platform through February and March. Now, my first 30 days are up and I’ve been astounded at the results. But first, you’re probably saying: hasn’t the last month been a positive run for crypto? Yes, but not much. In the last month, the crypto market capitalization went from $132 billion to $139 billion—an increase of about 5%. So I made about that 5% (more or less, since I use a balanced portfolio which I discuss with my investing community here). But, on top of that, I made an additional 20% profit. And I’ll show you HOW and the numbers below. But First….How Does Kaktana’s Bot Trade? Kaktana allows you to link your Binance or Bitmex accounts to their trading algorithms and bots. This can be done within a few minutes and then you’re good to go. From there, you can set your own technical analysis-based trading patterns for algorithmic trading (profit while you sleep!). Or, if you’d rather—and this is what I did—you can use three of their pre-made strategies for your trading. I like using these (and I’ve used and am using all three) because I get to learn about the technical analysis routes while I’m earning profits on the trades. The platform explains what the strategy is for each of these—but each is designed for fast trading that takes advantages of technical factors like moving averages in trading pairs. There’s also a full log that you can view trades on. I’ll take about my best performing pair below—VET/ETH, but Kaktana let’s you also see full trade details (you can also get email and Telegram notifications). I’ll show the log results for my VET/ETH pair (the best one) below. Before I go into the VET/ETH bot—which made an astounding +40% profit in its first month, I’ll show the aggregate results (not all bots trading as well). Throughout the one month experiment, I put in about 3.8 ETH and .06 BTC. 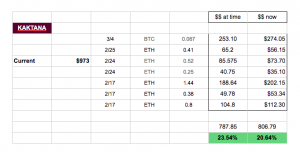 The values at the time of deposit (in Binance) came to be about $787. Those values now, had I just held the coins, is about $806. That’s about a 2.5% increase. And yet, the value of those coins after the trading bot did its work is $973.That’s a +20% increase from the ‘holding’ model of those coins and a 23.5% increase from my starting value. And that was just my testing ground. A big part of this success was due to one pair—the VET/ETH pairing on which I used the 1H Bollinger Bands Bounce. This one trading pair gave me a 40.52% return — though you can see from my screenshot below that not everything trades this well. As you can see, I benefited from two big trades—one that gave a 8-ish% return and another that is near 14.80%. But still, the majority of trades were on the positive side and the Average and Median Profit is on the positive side. I like reviewing these notes to see if there are tweaks I want to make to the pre-made strategies or devote more of my portfolio to one or the other. Needless to say, I’ve added to my trading account that I have Kaktana hooked up into. I know there are a lot of trading bot platforms out there but some seem shady and others seem too technical for me to understand. That’s why I liked Kaktana on the first go—and the idea of testing and backtesting before committing real coins. I even responded to one of those ‘How Is Your Trial Going’ e-mails that I always get and actually found myself in conversation with the founder and main programmer, Alex. He was enthusiastic about my results and open to chatting more on his platform. I liked being able to connect to the builders and felt safer knowing I could ask him questions. I’m writing this because I believe in their platform and I’ve seen the reward of the service already. You can use any of the referral links in this article to check it out for yourself. Go in, test the strategies, and then see if you can make more profit while you sleep with this new algorithmic crypto trading bot!